"Here is a photo that I took of the tramwayman's shelter for the old horse-drawn tram, at the west end of Strathearn Place. it is now in the car park of the old Iona Hotel. Up until 1897 Strathearn Place was a cul de sac and the horse drawn trams turned around here. During 1897, a villa was purchased at the west end of Strathearn Place and duly demolished to allow the trams access to Churchill and Morningside." "Below is another view of the same shelter. looking to the south across Strathearn Place towards the shelter"
I believe that this shelter also served some purpose in the days of the cable cars, but I don't have the details. It may have involved some single-track running. The cable car route along Strathearn Place and on towards Morningside can be seen in in the upper left quarter of this 1915 map. Just to the left of the centre of this 1870 map, Strathearn Place can be seen, but not yet built or named. It is the street extending to the left from Strathearn Road, in the area which, for some reason, has 'Games' written vertically across it. The Villa in Greenhill Gardens, in line with the western end of Strathearn Place, mentioned above as having been demolished in 1897, can also be seen on this map. Looking to the south across Strathearn Place. "It may be of interest that when I worked as a part-time barman at the Iona Hotel in the 1970-80s, the Tramwayman's Shelter was home to Jimmy Sneddon who will no doubt be remembered by Iona regulars of that period." "I cannot imagine that this building ever had any tramway connection, as the through road gained by the demolition of a detached house was not available until 1900 and cable cars started to run in April that year. Evidently for some technical reason the service was initially a shuttle Churchhill to Salisbury Place but soon would have come from town via Bruntsfield and into Churchhill." "The cable car operation would be unlikely to require a bothy at that point. The horse trams did not pass that way at all as the street was then incomplete and they travelled from Beaufort Road to Churchhill via Kilgraston Road, Hope Terrace, Whitehouse Loan and Clinton Road and therefore were not passing the bothy. All track in Clinton Road etc was quickly removed when cable operation started but a short length of single track remained in Hope Terrace until about 1926 for whatever reason. (After I gave a talk on Edinburgh Trams some years ago an older gentleman told me he remembered this piece of track and had always wondered why on earth it was there!)" "As far as the building is concerned it would have been in the garden of the house which later became the Iona Hotel which would have had a wall continuing north as the back boundary of the house in Greenhill Gardens. I think it would be a garden potting shed which by luck did not need to be demolished when the road was driven through. Travelling eastwards from Greenhill into Strathearn Place the shape of the original house garden is evident from the remaining stone walls." "During WW2 in the gardens in the centre of Greenhill Gardens was a static emergency water supply sited over the graves of plague victims who I believe were buried in a pit of lime." 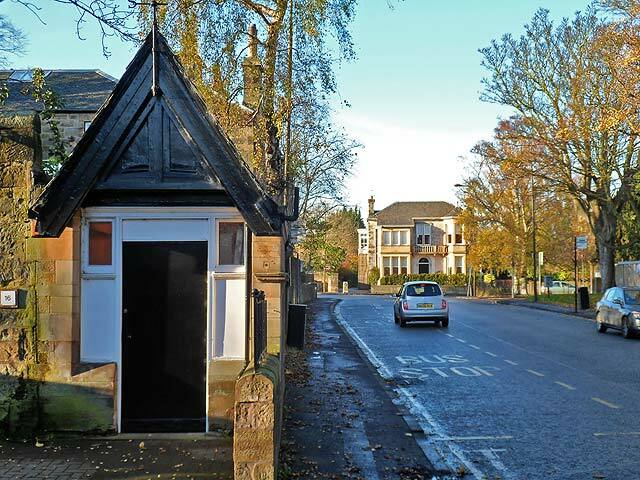 "I would be interested in any comments from others about this quaint little building which I recall from my earliest days, when passing in the electric trams which incidentally were on single track (controlled by lights) along the length of Strathearn Place." ... a line, partly single and partly double, from the top of Marchmont Road through Strathearn Road and Strathearn Place which was to be continued through into Greenhill Gardens by the acquisition and demolition of some property. Thus, the new line would join into the existing line again at Churchhill." "On 1 June 1899, the Board of Trade inspected the new route along Strathearn Road and Strathearn Place, and the horse car service was transferred to it from the narrow twisting Hope Terrace and Clinton Road route. Strathearn Place was also narrow, but instead of having an orthodox single line, was laid with closely interlaced rails with one common conduit and slot for the future cable. The object of this was to avoid the noise associated with points. There was also a short single line section in Strathearn Road. The old line through Clinton Road was lifted in February 1900. There may also be other references, that I've not found, to Strathearn Place or even to the Tramwayman's Shelter, in this book or in the 'Edinburgh Transport - The Corporation Years' . "I am not surprised that the horse car service used the new cable tracks as soon as these were available (about 9 months before cable power). I still do not see why the bothy would have been for tram crews at that location as Church Hill was the terminus for many years before, when the service went by Clinton Road. Also it is a unique design and unlike anything provided for crew comfort anywhere else. I hope more comments are forthcoming about this unusual folly." "As for the tramwaymen’s shelter, I have nothing to add other than that I don’t know why they would need a shelter there. - There were no points to control as you have shown (although even, for example, at the Post Office these were controlled by open-air gear, with small kiosks added in the ‘electric’ days, not substantial stone buildings)." 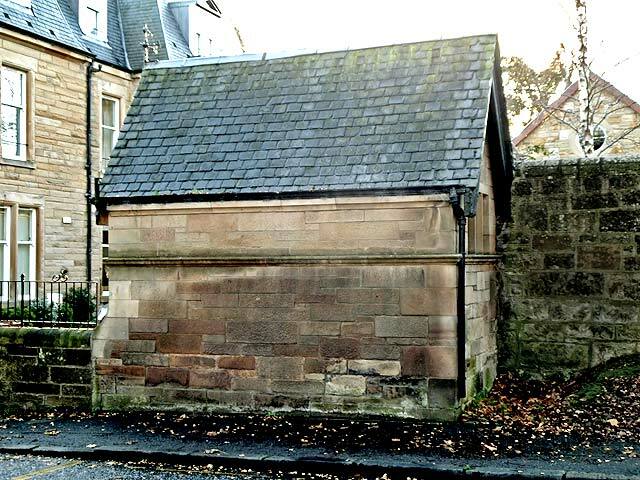 "I note that there are a couple of contributors querying the tramwaymen's shelter in Strathearn Place. I assume Mr smith researched this fact before publishing his book, so who's right?" "I was talking to the former owner of the Iona hotel last night and asked him about the small building mentioned in this recollection. He told me that he bought it from Edinburgh Corporation some 40 years ago. - He said there used to be a horse trough outside it on the Strathearn Place elevation, and it had been used by stagecoaches in the past. - He said someone did indeed live in it for 20+ years. Another person suggested it was the hotel chef. - He said it had been used in connection with the trams, as it was a single-track in that area, and the ropes required for repositioning the tram lines were stored there. People with more knowledge of trams may be able to explain this better than me. - He also said that the wall behind it was the formerly the city boundary."